welcome to prospective Gemini ownership. there are a few off us on here ...matybe not enough to start a "lets see your gemini rig" picture thread....so you can search and find some posts about them....MitchC who posts on here has a 7 metre I think. to 5m to compete in RB4. I can compare mine to my previous boats, a 4m searider and a Humber Assault, and I find that it rides better than both of those. Its a little wet, but feels extremely well put together. Love the full length Aluminium keel guard fitted to it. Very seaworthy. Only a 6 mtr I'm afraid, and probably the sister boat to the one you are looking at. There were 10 identical RIBs made as support boats to the 2000 Clipper RTW yacht race and then used as charter boats in the solent. The original layout was console at the back with 6 jockey seats in front. They were all named after birds of prey, ours is called Kestrel. They originally had 150 optimax Mariner engines fitted, with ~150lts under floor tanks. I've moved the console into a similar position to the one you are looking at, it makes the boat much more balanced. I've been out in some mad big seas and the boat handled it easily. With the 150 opti, we've seen 46 knots, two up with 1/2 full tanks. I've just had mine re-tubed and currently polishing the hull, which so far is coming up like new! I'll post some photo's once it's done. Any bad points...it's a bit easier to stuff the nose as it doesn't have the upswept bow as some UK boats do, but apart from that I'm really happy. If you google Gemini RIBs you'll see some great images; in South Africa they launch them of the beach through the surf...very cool. It's a 6m wave rider. From what the guy has told me the motor is the same year as the boat a 99 model, and it has a 120ltr tank, so with it been fitted from new with smaller 4stroke maybe they put a smaller tank in..
A pal of mine recently sold a 5.5. I thought it was a bit of a medium Vee, leisure orientated rib. More comfort and inshore than a true offshore outfit. It also had underfloor storage which tended to annoyingly flood. Our retube was due to age of tubes, they'd started to lose a little air and in places were coming slightly detached. Also looked a bit tatty due to the UV degradation of the blue wear patches and grab ropes. They'll be a HIN number stamped on the transom and a plate with model details, you'll be able to work out the year from that. Again from the engine number you should be able to work out the year. I saw the photos on ebay. Not sure that the stainless transom plate and cap is original, I'd have a good look inside the transom and check for other engine mount holes or repairs. Good luck, I hope you like it. They are built like brick out houses. 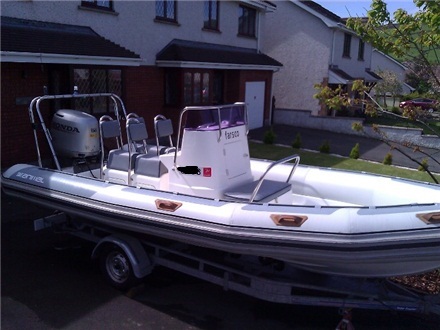 Definitely not just an inshore leisure rib, i'd put mine up against any RIB in any condition and be very confident we'd come out ok....! Yep the underfloor storage is great but can be a bit leaky from water on the deck. Ours is resealed with larger rubber strips and now is almost 100% dry. Any water that does gather has a drain into the bilge and is pumped out with a auto pump. the tubes have been replaced on mine as well... due to age, and some part of its previous life being spent as a watersports/ activity centre/ski boat. As mitch says the hulls are built like brick proverbials. Contrary to what Mollers friend says, I cant see anyway in the world that the hull is a medium v, and its not leisure enough for the South African lifeboat institution or the Australian special forces. Mine doesn't have underfloor storage, it has a 200 litre full length tank. The deck is made up of panels though, some are sealed up on mine and some latched for access, always have a bilge pump down there, only time mine has flooded has been when I had smashed my bilge pump and didnt realise, and with the boat on a mooring and uncovered it sat through a torrential rain storm one night. As Mitch says - they have a ton of bouyancy and even flooded it was still afloat. Dont take our word for it though, if your parting with cash, insist on a sea trial and make your own mind up. If they wont sea trial it, be a little concerned. Check the condition of the tubes and the seams carefully, all the usual stuff, see the engine running on muffs etc.